Cardstock piece, approx. 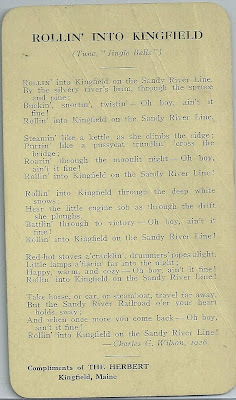 5" x 3", "compliments of THE HERBERT, Kingfield, Maine", showing the lyrics to the song "Rollin' Into Kingfield", written by Charles G. Wilson in 1926, to be sung to the tune of "Jingle Bells", in celebration of the Sandy River Railroad. Buckin', snortin', twistin' - Oh boy, ain't it fine! Rollin' into Kingfield on the Sandy River Line. Roarin' through the moonlit night - Oh boy, ain't it fine! 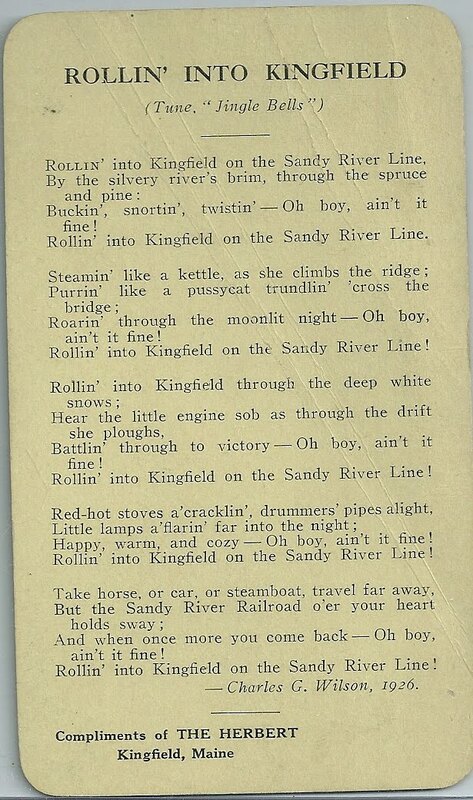 Rollin' into Kingfield on the Sandy River Line! Battlin' through to victory - Oh boy, ain't it fine! Happy, warm and cozy - Oh boy, ain't it fine! And when once more you come back - Oh boy, ain't it fine! Charles G. Wilson was a poet, author, photographer and artist. In 1968, he and his wife Alma donated the building that became home to the Kingfield Historical Society in 1970. According to an entry in the 1930 Census for Kingfield, Maine, Charles was born about 1898 in Pennsylvania; he listed his occupation as Author. Alma was born about 1891 in Massachusetts. From an online source, I found that Charles settled in Kingfield in the 1920s. Hopefully you will enjoy this memento of celebrating Kingfield, the Sandy River Railroad and The Herbert Hotel. If you have any information to share on the family of Charles G. Wilson and wife Alma, please contact me.